Miss Kelly : Learn About Shariah at Harvard This Weekend! Learn About Shariah at Harvard This Weekend! The Harvard Islamic Society sent out an announcement about a lecture this weekend: Living in the Modern World: The Maqasid (aims) of the Shari`ah. 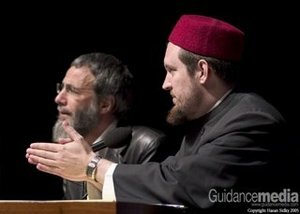 "Shaykh Jihad Hashim-Brown has extensive training in the Islamic sciences, as well as a wealth of experience engaging with issues of the modern world. In the public lecture on Saturday, he will offer advice on how to deal with the circumstances of today from an Islamic perspective, be it the portrayal of Islam in the media or everyday life in college. The lecture will be followed by an extensive Q&A session; please bring any and all questions you may have!! During the workshop on Sunday, Shaykh Jihad will provide us with an introduction to the classical text of al-Raghib al-Isfahan, "al-Dhari'ah ila Makarim al-Shari'ah". This text points the way toward defining an Islamic worldview." "For more information, please see: http://www.bukhari-institute.org"
Well, it's open to the public, and Seever Hall is a large auditorium. This is a great chance for interested folk to learn about shariah creep at at the multicultural, inclusive Harvard University. I heard a great comeback to those who would try to defend Harvard's gymnaceous dhimmitude by Greg Gutfield on Fox News's Red Eye last night asking how they would respond to a Muslim who demanded heterosexual-men-only times because it went against his religion to associate with gays? Ironically, "gymno" is Greek for naked. We may eventually need to refer to endomaceous (clothed) dhimmitude. My religion strictly prohibits being around muslims, do you think they would accomidate my use of their gym by having a muslim free time?